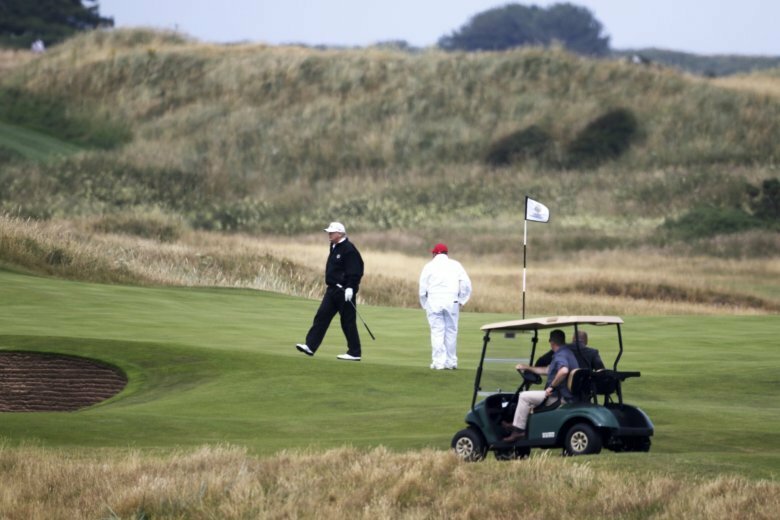 NEW YORK (AP) — President Donald Trump’s flagship golf resort in Scotland has lost millions of dollars for a fourth year in a row. His Turnberry resort on the Irish Sea lost 3.4 million pounds ($4.4 million dollars at current exchange rates) in 2017, despite opening a new course and refurbished hotel, according to a report from Britain’s Companies House. The losses add to the woes of a Scottish golf business that has faced a backlash from anti-Trump protesters and has tussled for years with regulators and environmentalists. The losses, however, are significantly smaller than last year’s. The resort was closed for six months in 2016 while a hotel and grounds were being refurbished. Results for Trump’s second Scottish golf resort near Aberdeen on the North Sea haven’t been released yet. Trump’s company has struggled since it ventured into Scotland a dozen years ago. He fought with landowners who refused to sell to him and with regulators objecting to his buildings plans. He also recently lost a court fight to stop an offshore windmill farm near one of his courses. The losses at Turnberry come after setbacks at other Trump golf clubs, including declining figures at his courses in New York City and Los Angeles. Since his business is private, it’s not clear how many of his other resorts are doing, and his golf business overall. The Turnberry losses appear to have come as a surprise to some in the company. The general manager of the resort told the Guardian newspaper last year that he expected a profit in 2017 on much higher revenue. The president’s son, Eric Trump, also had high hopes at the time. In a letter accompanying the resort’s 2016 financial report, he said his course had received “excellent reviews” from its guests and that reopening the resort will usher in an “exciting new era” for the company. Eric Trump is a director of the British subsidiary of the Trump Organization that owns the two Scottish resorts.